Meet D. The super smooth self-sanitising applicator. Each one saves thousands of pieces of plastic. Enjoy comfort without compromise. Designed to be easy and hygienic. D is made from medical grade Mediprene®. It's BPA free, antimicrobial and fits all tampon sizes. D Comes with 6 organic tampons (3 regular and 3 super), a cotton travel pouch and a reusable bathroom tin. We believe everyday products should be kinder to you and the planet. Our innovative designs offer low-impact, high performance alternatives. 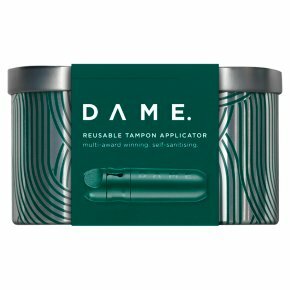 If you want better more sustainable choices, join DAME. Tampons are associated with Toxic Shock Syndrome (TSS). This is a rare but serious illness that may be fatal. Use the lowest absorbency for your flow. Please read and keep the leaflet inside.